Benjamin "Harrison" Kennedy was born in 1889 in the Webster community of Taylor County, WV, the son of Josiah and Ruth Ann (Minerd) Kennedy Sr. He was named for Benjamin Harrison, the newly elected President of the United States who served from 1889 to 1893. He was of medium height and build, with brown hair and brown eyes. In his early 20s, the unmarried Harrison resided with his brother Josiah Kennedy Jr. in Barbour County in 1910, when the census was taken. 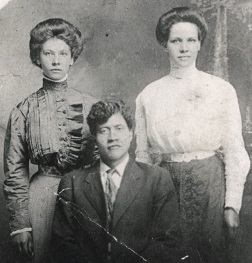 At the age of 21, on Oct. 15, 1910, Harrison married 20-year-old Elsina Mayle (1890- ? 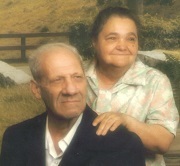 ), the daughter of Melchior "Melker" Martin and Alcinda (Mayle) Mayle. Her father was the informant for their marriage license, and the ceremony was held in Dantown, WV, conducted by W.H. Sturn. The Kennedys had at least nine children -- Joseph Kennedy, Ressie "Ray" Kennedy, Frederick Kennedy, Hubert Kennedy, Rozetta Kennedy, Maxine Kennedy, Ruth Kennedy, William A. Kennedy and Dessie Jane Mayle. They lived in Meriden near Philippi in 1917, and at Philippi circa 1925. Circa 1917, Harrison worked as a coal miner with Lee J. Sandridge, who also employed some of Harrison's cousins. During World War I, he registered for the military draft. On the registration card, he gave his race as "colored." He eventually retired as a coal miner with the Kennedy-Mayle Coal Company -- a family-owned business. Heartache rocked the family when daughter Rozetta died at age six months, on New Year's Day 1926, and young daughter Maxine passed away of pneumonia on July 19, 1931, with the burial of both girls at Chestnut Ridge. When the federal census was taken in 1930, the Kennedys lived in Barbour County, with Harrison employed as a coal miner. By 1934, they were in Morgan(town? ), WV. Records of the West Virginia Office of Miners' Health, Safety and Training show that the Kennedy-Mayle company was in operation for only two years, in 1947 and 1948. In 1947, the company produced 13,772 tons of coal. The following year, the output increased to 20,421 tons. Why the business ceased producing in 1949 is not yet known, but the mine may have been tapped out. At the time of Harrison's death, at the age of 63 on March 2, 1953, he and Elsina lived in Hildebrand in the outskirts of Morgantown, Monongalia County, WV, where he was a coal miner. The cause of his death was a coronary occlusion. He was laid to rest in the Arnettsville Cemetery. Daughter Dessie Kennedy (1911- ? ) was born in 1911. Son William A. Kennedy (1914-1995) was born in 1914. He lived in Booth, Monongalia County, WV. William married Devon Norris (1918-1997), daughter of Granville and Mary Pearl Norris. In an interesting twist, Devon's brother, Ervin Norris, was married to William's cousin, Maxine Croston (1934-2005), daughter of Blaine and Alta (Miner) Croston and granddaughter of George Riley and Sarah Ann "Sally" (Croston) Minard. The Kennedys had 11 children -- Norman Kennedy, William Jr. Kennedy, Sammy Kennedy, Mary Tichenor, Arthur Gerald Kennedy, Linda L. Mayle, Irene Mayle, Janet Minard, Dora Jean Mayle, Hubert Lee Kennedy and Edith McCartney. In the late 1950s or early '60s, the family relocated to Zanesville, Muskingum County, OH. Circa 1982, William made his home in Canton's Allegheny Nation Indian Community Center. In a freak accident, while in the game room of the Center on Sept. 21, 1982, William and his grandsons William Kennedy III and Paul Mayle were injured and son-in-law Gary F. Mayle killed when a drunk driver crashed her vehicle crashed through the front doors. William died in 1995 at the age of 81. Devon outlived him by two years, and passed in Canton at the age of 79, on March 8, 1997. They are buried together in Evergreen Cemetery. Daughter Edith Kennedy married Waitman McCartney Jr., son of Lawrence Waitman and Evelyn (Croston) McCartney of the family of George Riley Minard. See the Minard biography for more. Daughter Linda L. Kennedy (1948-2017) was born on June 15, 1948 in Morgantown, Monongalia County, WV. She married Gary F. Mayle (June 9, 1947-1982). Their three children were Christine Mayle, Gary Mayle and Paul Mayle. The Mayles made their home at Avon Place Northeast in Canton and were members of the Christ Apostolic Church. Tragedy rocked the family on Sept. 21, 1982 when Gary was killed in a freak accident at the age of 35 while in Canton's Allegheny Nation Indian Community Center. Reported the Akron Beacon Journal, he and his father in law and four others were playing pool and electronic games inside the center at Mahoning Road and Royal Avenue Northeast... [when] a car crashed through the front doors." He was rushed to Canton Timken Mercy Medical Center where he was pronounced dead on arrival. Son Paul, father in law William A. Kennedy and nephews William Kennedy III and Hubert Kennedy were among those injured. A 32-year-old woman was charged with vehicular homicide, reckless operation of a vehicle and driving while intoxicated. Linda survived her spouse by 35 years. At some point she moved from Canton to New Philadelphia, OH. She died in the Bethany Nursing Home at the age of 68 on May 21, 2017. Following funeral services led by Rev. Al V. Walker, her remains were lowered into eternal repose in Evergreen Memorial Gardens. An obituary noted that her survivors included a dozen grandchildren and a dozen great-grandchildren. Son Norman Kennedy makes his home in Canton. Son William "Junior" Kennedy (1937-2019) was born on Feb. 9, 1937 in Morgantown, Monongalia County, WV. As a young man, he joined his family on their move to Canton, Stark County, OH. He remained in Canton for the balance of his life. On Nov. 19, 1965, when he was 28 years of age, he was joined in holy wedlock with Mae Newman ( ? -living). The nine children born to this marriage were Teri Jean Kennedy, Marie Kennedy, Becky Mayle, Loretta Schroader, Betty Tabler, Little Billy Kennedy, Big Bill Kennedy, Clinton Goodwin and Lee Kennedy. For more than three decades, William was employed as a mental health worker. He retired in 2002 at the age of 65. In his free time, he served as Chief of the Allegany Nation Indian Center and a board director of the Apostolic Believers Church in Canton. He and Mae endured the grief of the loss of their daughter Teri Jean and grandson William Kennedy Jr. At the age of 82, at home, William passed into eternity on March 23, 2019. An obituary numbered his offspring as 16 grandchildren, 22 great-grandchildren and one great-great granddaughter. Pastor Alice Walker led the funeral service. Granddaughter Teri Jean Kennedy was deceased by 2019. Granddaughter Marie Kennedy resided in Philippi in 2019. Granddaughter Becky Kennedy married Michael "Mike" Mayle and lived in Canton. Branddaughter Loretta Kennedy wedded Mark Schroader. They make a home in Canton. Granddaughter Betty Kennedy was united in wedlock with Lyndal Tabler. They dwell in East Canton. Grandson Little Billy Kennedy resides in Philippi. Grandson Big Bill Kennedy lives in Canton. Grandson Clinton Goodwin was joined in matrimony with Kimberly and their home is in San Diego. Grandson Lee Kennedy resided with his parents in Canton in 2019. Son Sammy Kennedy was deceased by 2017. Daughter Mary Kennedy married (?) Tichenor and lived in Canton. Son Arthur Gerald Kennedy dwells in Newcomerstown, OH. Daughter Irene Kennedy wedded (?) Mayle. They resided in 2017 in Canton. Daughter Janet Kennedy was joined in matrimony with (?) Minard and dwells in Grafton. Daughter Dora Jean Kennedy was united in wedlock with (?) Mayle. Circa 2017, their home was in Canton. Son Hubert Lee Kennedy was deceased by 2017. Son Joseph Kennedy (1916- ? ) was born in 1916. As an adult, he made his residence in Hildebrand in the outskirts of Morgantown, Monongalia County, WV. Son Ressie " Ray" Kennedy (1919- ? ) -- named after an uncle -- was born in 1919. He resided in Canton, Stark County, OH in 1953. Nothing more is known. Son Frederick E. Kennedy (1920- ? ) was born in 1920. Fred made his home in Booth, Monongalia County, WV. Son Hubert E. Kennedy (1922- ? ) was born in 1922. In adulthood, he lived in Canton, Stark County, OH. Daughter Rozetta Kennedy (1925-1926) was born on June 3, 1925. As a baby she suffered from pneumonia, and succumbed on New Year's Day 1926, at age six months, 28 days. Burial was in Chestnut Ridge Cemetery. Daughter Maxine Kennedy (1927-1931) was born on July 27, 1927. Sadly, she did not survive childhood. As she neared her fourth birthday, little Maxine contracted a case of the measles which led to pneumonia. Unable to recover, she died at the age of three years, 11 months and 22 days on July 19, 1931. Her tender remains were laid to rest in the Chestnut Ridge Cemetery. Daughter Ruth Rosemary Kennedy (1929- ? ) was born on Aug. 27, 1929 in Philippi. At the age of 22, on Oct. 16, 1951, she married 24-year-old Charles A. Montgomery (1927- ? ), the son of Walter H. and Esther Ellen (Kuffman) Montgomery of Lewiston, PA. The nuptials were performed by Rev. William C. Swartz of the Presbyterian church in Morgantown. At the time of marriage, Ruth resided in Morgantown, Monongalia County, WV, and Charles in Chevy Chase, MD. 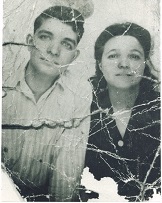 Circa 1953, they lived in Wilmington, NC.